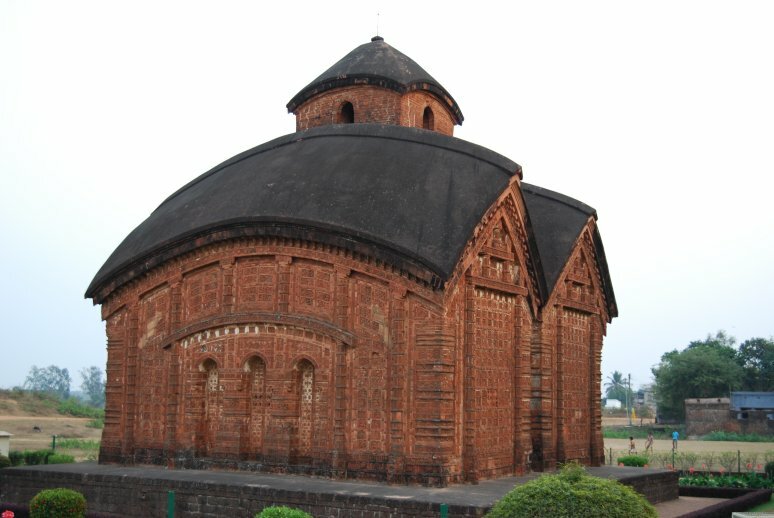 Bishnupur is famous for its terracotta temples and Balucheri Sarees. The majestic temples were made out of the local laterite soil and brick. It is generally covered with terracotta tiles depicting scenes from Mahabharata and Ramayana. The temples were built between 17nth and 18nth Centuries. The terracotta temples here are the best specimen of the classical style of Bengali architecture and also an immortal contribution to the cultural heritage of the country. The common pattern of these temples is square base with semi-pyramid structure built on this platform. The walls made of late rite is usually has scenes from Hindu puranas like Mahabharata and Ramayan. Another noteworthy is its spacious interiors. Jor-Bangla or Ksheta-Raya temple, Ras Mancha temple, Madan-Mohana Temple and Shyam-Raya temples are the prominent among Bishnupur temples. These temples provide good specimen to the terracotta architecture of the Bishnupur temples, which is spread across the Bankura district of West Bengal. All the four temple are now under the control of Archeological Survey of India (ASI). Bishnupur is 140 from kilometers from Kolkata. It is well-connected by rail and road. Nearest air port is at Dum Dum, Kolkata. The Jor-Bangla templeis dedicated to Lord Chaithanya (Lord Vishnu with four hands); believed to be built by the Malla ruler Raghunath Singha in 1655 AD. At present no worship is taking place.